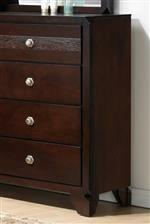 This stylish chest of drawers is a wonderful addition to any decor. 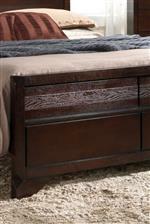 The chest has five drawers providing plenty of storage in your bedroom. The piece is mostly unadorned, but subtle details such as trimmed top corners and feet to match adding interesting elements. A band of rougher finish spans the top drawer, adding an additional stylish touch that can be found on other pieces in the collection. The Tamblin Chest of Drawers by Crown Mark at Casa Leaders Inc. in the Wilmington, Long Beach, Torrance, Lakewood, Los Angeles area. Product availability may vary. Contact us for the most current availability on this product. This collection of bedroom furniture will look great in any home. The stylish collection effortlessly blends traditional forms with updated details such as geometric hardware and unique corners and feet. A band with a rougher finish runs along the top of each of the pieces, breaking up the face of the case-pieces and tying the set together. The Tamblin collection is a great option if you are looking for Transitional furniture in the Wilmington, Long Beach, Torrance, Lakewood, Los Angeles area. Browse other items in the Tamblin collection from Casa Leaders Inc. in the Wilmington, Long Beach, Torrance, Lakewood, Los Angeles area.